Kali Katerberg/Daily Mining Gazette JROTC students display historical versions of the U.S. flag. 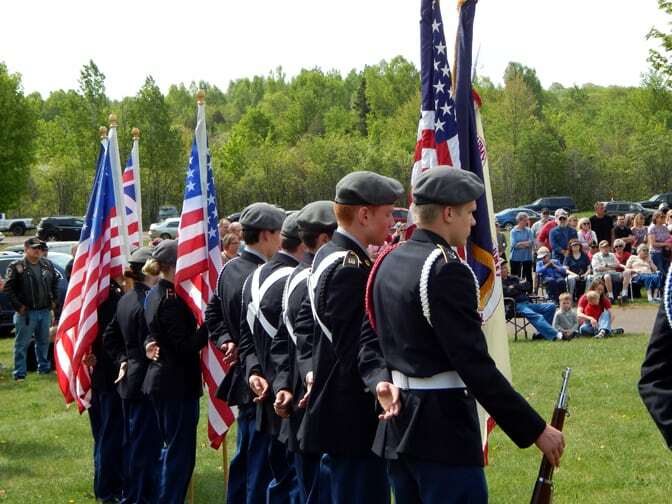 CALUMET — Flags flapped in the warm spring wind on Monday, as veterans saluted and taps was played in ceremonies here and across the country on Memorial Day. 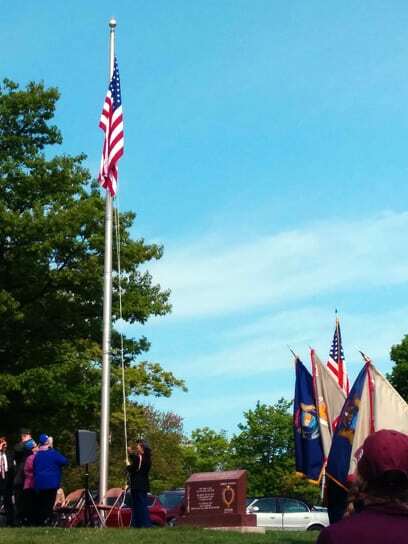 The annual ceremony in Lakeview Cemetery was one of many observances held in and around the greater Copper Country region. This year’s event in Calumet included a moment of silence for Marshall Kipina, a soldier from Calumet who served in the Vietnam War and until his remains were identified recently was listed as missing in action. Years after his death in 1966, Kipina has finally been accounted for. 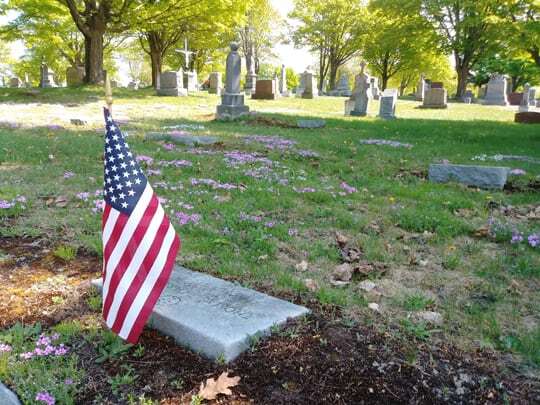 In Lakeview Cemetery alone there are more than 400 known veterans. The actual number of veterans buried there could be as high as 3,000, said Legion Post 61 commander David Crowley. Kali Katerberg/Daily Mining Gazette Calumet JROTC students raise the flag from half-staff as taps is played. One of the speakers, Crowley likes to see the numerous young people and the continuous large crowds attending the ceremony. “This has been going on 50-some years, because it was going on when I was in high school,” he said. Crowley said Memorial Day is a time for all Americans to consider the cost of freedom. For the veterans and non-veterans alike, Memorial Day is an important reminder, said retired Marine Lt. Col. Lee Barkell. 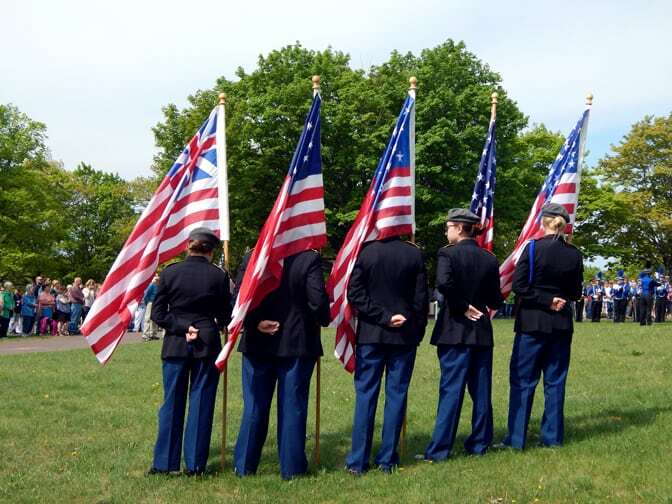 Kali Katerberg/Daily Mining Gazette JROTC students stand at attention and present the colors at the annual Memorial Day ceremony in Lakeview Cemetery. Even for those who made it home, life isn’t the same, and that impacts entire families. For those who lose a loved one in battle, the impact is even greater. Retired Marine Lt. Col. Casey Polkinghorne, a speaker at the Calumet ceremony, encouraged those in attendance to pass on the importance of Memorial Day to their children and be thankful for that sacrifice. Kali Katerberg/ Daily Mining Gazette One of the many flags placed on the graves of veterans for Memorial Day in Lakeview Cemetery.